Follow the upgrade path to the home theater of your dreams. An economic rule of thumb in the audio/video universe: The person who spends $7500 on a home-theater system is probably spending a bigger chunk of their annual income than the person who writes a check for $40,000. No wonder the goal can seem as far away as the Emerald City, along a road strewn with costly and dizzying obstacles. One such pitfall is the Sea of Poppies effect; you become paralyzed by indecision over how to build the home theater of your dreams. But it doesn’t have to be that way. It’s quite possible to build your project on the installment plan, step by step, and to have a bit of adventure along the way. If you can put together $1500 a year over three years, or $2500 times three at similar intervals, the monthly cost is likely to be much less than rent. And neither all the money, nor all the equipment, need be on hand to begin appreciating the effect of a home theater’s explosive impact on a movie like Die Hard With a Vengeance. The trick in piecemeal assembly is to buy in an order that increases the fun quotient as you go along, and to apportion the spending so that you have a well-integrated system when you’re done. Details can wait, but the vision must be clear before the first purchase is made. We’re going to run through this exercise from the standpoint of a $4500 overall budget and a $7500 overall budget, but the approach also can work with a more generous tab of $10,000. You’ll want to divide your equipment purchases into related groups that can be enjoyed immediately, but where to start will depend on what you already have on hand. The purchase modules in this case will be: 1) a big- screen television and a source for watching movies; 2) three front speakers and an audio/video receiver; and 3) two rear speakers, subwoofer(s), and another program source. If your television screen measures less than 27 inches diagonal, then a bigger monitor is where you’ll want to start. With a big screen, you’ll need a better program source than cable broadcasts or an ordinary VCR. Almost any signal looks okay on a small TV, but a bigger screen will reveal the grunge. An inexpensive laserdisc player or a satellite dish will get you over the hurdle. If your TV is already of more than modest proportion, then go for the array of front speakers and A/V receiver. Big sound can double the impact of a 32-inch TV. You’ll feel you’ve expanded the image as well as the sound, and you can always enlarge the monitor later. The third step in almost all cases will be the surround speakers and a powered subwoofer or pair of subs. These are the sources of the high- octane spatial effects and earth-shattering rumbles that have come to be associated with cinematic action, yet this is the step that tends to remain undone in jerry-rigged home-theater systems. That is a pity, because the result is like stepping into a hologram. With front speakers, you get something like cinematic bas relief. With surrounds and subs comes me three-dimensionality. --- ---Step 1: Upgrade source components. The Pioneer CLD-S104 Laserdisc player (right) and Toshiba M-76 I HiFi VCR (above) are good choices. ------Step 2 and 3: Invest in high quality front speakers, then add subwoofers and surround speakers. Shown here is the complete B&W 600-series line up, along with PSB’s Subsonic III sub- woofer and Stratus Mini. Step 1: Television and program source Assuming at least a 10-percent discount, which is fairly typical, a $1500 budget is going to give you about $1700 of buying power, whereas a $2500 budget will yield maybe $2800. Figure $400 to $500 for a program source, and you have $1250 for your TV on the smaller bud get, $2400 on the higher budget. The best buys in the lower price range are without question the 31-inch and 32-inch direct-view TVs. Aim for some thing like the RCA Home Theatre HP 32-inch table-top model F32730SB ($1249; add $200 for the optional base). Its suede-black exterior will disappear in a darkened room, its 579 lines of horizontal resolution will adapt to the new signal technologies, and its 16-jack array of A/V inputs and outputs includes 5- video. Those are good entry-level features. You won’t be wasting money on stereo sound, because this TV comes with only 10 watts, which you’re not going to use anyway. Similar features appear in the Philips model FS3262A ($1299), which offers a crisp, well-modulated picture in an attractive, slim-line, floor-standing pack age. It is finished in black (an oak cabinet is optional) and is rated at an ample 600 lines of resolution with plenty of A/V jacks, including S-video. Either of these choices should leave enough money in the budget for a high- quality program source, such as the $299 Pioneer CLD-s104 laserdisc player, or one of Toshiba’s new 6-head VCRs such as the model M-761 ($499), which comes with circuitry to reduce horizontal color bleeding. And remember, if the TV is your first home-theater purchase but you have an older stereo system, you may be able to route your television audio through your stereo for better sound. You won’t get surround sound, but you will hear some thing that will whet your appetite. With a bigger budget comes a bigger picture. The prices are coming down on 45-inch to 50-inch rear-projection TVs (PTVs). You might assume that the biggest possible screen size is the best, but there is such a thing as an image that’s too large. If you are close enough to the screen to be irritated by the horizontal lines into which the image is divided, you’re in trouble. Images can be refined with line doublers and quadruplers, but only with high-end front projectors and a stratospheric budget. A good screen size for most large rooms is 46 inches. Hitachi’s Ultravision models 46UX20B (in black) and 46U1X21K (in oak) have a recessed base for optional in-wall installation, 1000 lines of resolution, and a computerized digital convergence system. Both are $2499 and fit for the future. The RCA Home Theatre HP model P46734BA offers similar features for $2299. It is even possible to get comparable value in a 48-inch rear projection monitor in this price range—Toshiba’s model TP48E60, with a cabinet less than 20 inches deep, sells for $2299. And while you’re waiting to purchase a more powerful sound system, the Toshiba’s built- in speakers and amplifiers can be pressed into service as a center channel. Combined with left and right channels from your old stereo, this will give you an inkling of the impact that awaits. An ideal program source for these big sets would be a $700 DSS satellite system, which competes handily with laserdisc players for image quality and offers movies around the clock. 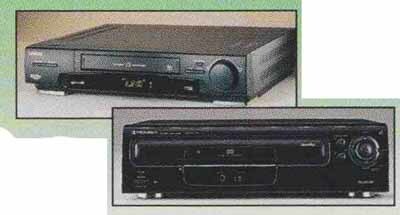 But a HiFi VCR, such as JVC’s model HR VP830 ($599) is also an excellent option for the person who likes to do a lot of taping. Tape is tape, which is inherently inferior as a medium, but this machine makes recordings that are clean enough to be tolerated on a big screen, and it offers some nifty rime-shifting features such as high-speed visual scanning while the audio plays in real nine. 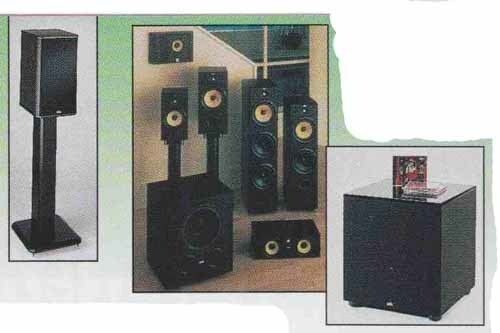 The home-theater industry used to insist that you string three identical speakers across the front of your viewing area, an idea that has never been practical. Thus, horizontal center channels have appeared in droves. Purchasing all three speakers from the same manufacturer offers at least some assurance that the sound is in the same sonic family. It is quite possible to mix and match front speakers on you’re own, but you’ll need to appear at the showroom with a movie that passes sound through each of the three speakers, such as the opening of Bade to the Future, which pans a room of ticking clocks, so that you can listen for a good match between center, right, and left. Whatever the surround systems of VY the future may bring, you can be sure that the front three speakers will be important. Spend some money on them— $900 of your $1500 budget, $2000 of your $2500 budget. And don’t hesitate to rake a few of your favorite CDs along to listen to when you’re picking them out. A/V dealers will have plenty of laserdiscs to look at, but listening to music that you already know, without benefit of a visual image, will help you deride if the personality of the speakers is something you can live with over rime. Loud and harsh noises may make a fine impact at first viewing, but derail and differentiation are the truly important qualities. ------Step 1: Gets big- screen TV. 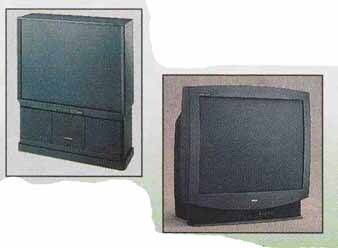 Shown here are the 32-inch RCA F32730SB (right) and the 46-inch Hitachi 46UX208 (above). ------Step 2: Add an A/V receiver, such as the Sony STR-6X800 ES (left), Yamaha RX-V690 (center), or Onkyo TX-S V727 (right). B&W makes some relatively inexpensive speakers designed for home theater use that handsomely pass the music test on a $900 budget—the rather hefty DM602 bookshelf speaker stands over 19 inches tall ($550/pair). Richness blooms from its 7-inch Kevlar drivers and one-inch aluminum-dome tweeter. No one would want to match these speakers with anything other than the center channel made for them—the $350 model CC6, whose 5-inch Kevlar drivers offer a seamless transition and a surprising amount of bass. With a larger budget, you could step up to B&W’s personable floor-standing sibling, the model DM603, which sell for $1000/pair. Or you could turn to another superb value, an array from PSB that starts with the meticulously designed Stratus Silver 2-way towers at $1500/pair; matched with the PSB C5 2-way center channel at $500. Even without a subwoofer, these towers pack a wallop, yet the some quality is true. The center channel design is unique, with side-by-side 5.25-inch woofers, and a vertical stack of two 1/2-inch tweeters. Although it is relatively modest in size—less than 20 inches wide and 7 inches tall—this center speaker holds its own against the mighty towers and offers clear dialogue throughout a fairly wide listening area. With either of these speaker arrays, the receiver should be a hearty one, and this is where the real bargains are to be had. Sony’s STR-GX800ES ($700), which offers 90 watts across the front and 30 in the rear, is an oft-cited example of the reliability of the current generation of receivers. It offers all the current formats of digital signal and surround processing without broaching the forthcoming issue of AC-3. It will be replaced in the late spring by the similarly-priced model GA7ES. Another solid bargain is the Yamaha RX-V690 ($699), which offers nine digital surround modes for music and A/V material in addition to Dolby Pro Logic processing. The PSB towers would respond well to the extra push that Onkyo’s TX SV727 receiver can deliver. Its 100 watts across the front really crank, and there’s high-precision digital audio processing at work through a 24-bit Motorola DSP chip. It’s a handsome, superbly integrated unit, streamlined through several generations of design. At $800, it’s a solid value. Assuming that this stage represents your second or third installment, plan on putting some money away here for a DVD player when they become avail able; figure $500 off the top. It must be mentioned that the future of surround sound seems to belong to Dolby AC-3. Unlike the current 4-channel matrixed Dolby Surround format—in which the surround channel is mono and of limited frequency response (the lows and highs are rolled off)—AC-3 delivers six discrete digital channels, including two full frequency range surrounds and a dedicated subwoofer channel. This gives AC- 3 the potential to free the rear-channel speakers from their ambient effect status, which means much more will be demanded of them. Thus, if your existing surround speakers can’t handle deep bass, you might want to think in terms of a subwoofer just for them. Looking at the current speaker lines offered by B&W and PSB (the two companies whose speakers were recommended previously), it’s possible to get an idea of where all this might be going. B&W offers some handsome, THX approved dipole speakers at $600/pair for wall mounting, but their range only extends down to 85 Hz. With AC-3 or another digital surround format on the way, a better choice for the surround speakers might be B&W’s $400/pair DM601 bookshelf units. (These are a step down from the model DM602 recommended previously for the front left and right speakers.) The DM601 extends down to 70 Hz, a difference that is audible over the THX dipole surrounds. The front speakers already offer quite a bit of bass, and when you add a B&W AS6 powered sub- woofer ($700) with 100 watts of power and a 12-inch, long-throw driver, the transformation to full-blown home theater will be complete. The best rear-channel speakers for the PSB set-up are the Stratus Minis at $950/pair, which are often cited for their audiophile quality despite their relatively small size. At 16 inches tall and 12.5 inches deep, they are not small compared with today’s diminutive surround speakers. In addition, they require mounting on stands. But they contain 6.5”drivers that extend down to 55 Hz and should be all that is needed for a surround system of the future. In a Dolby Pro Logic setup, their performance would be acceptable with just 30 watts; they need twice that or more to really rock with AC-3. Fortunately, the receivers of tomorrow will undoubtedly take the higher power requirements into account. As for subwoofers, a legitimate question is, how many? PSB recently introduced a knockout subwoofer with 180 watts of power called the Subsonic III ($799), which belies the tidy look of the 16-inch cube it comes in. It is all the bass most rooms will ever need, but some may decide they’d rather have two 90- watt subs to avoid the directional pull of a single sub. PSB can do this, too. Two Subsonic II subs ($599/ca.) will give you flexibility in anticipation of future surround. Even in the realm of deep bass, it always pays to keep your options open. Boston Acoustics speaker systems are available in these countries.